Root canal therapy (aka endodontic treatment) is like CPR for a tooth; it saves a tooth from unnecessary extraction. During root canal treatment, the infected or badly decayed tooth’s nerve is removed and the nerve and pulp chamber is cleaned and sealed. 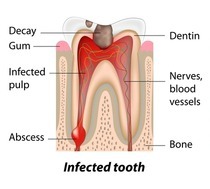 If you are experiencing any of the above symptoms, the nerve inside your tooth may be abscessed (infected), diseased, or injured. Your tooth pain will not go away and will likely only get worse. Call Dentistry For the Entire Family at 763-586-9988 for an dental examination by one of our root canal specialist dentists or click below to request an appointment online. Same day (Monday-Friday) emergency dentist appointments are available. When your in extreme pain, you may feel that extracting or pulling your tooth is the only option. This is untrue. Advancements in root canal therapy enable you to get out of pain without having to have your tooth extracted. 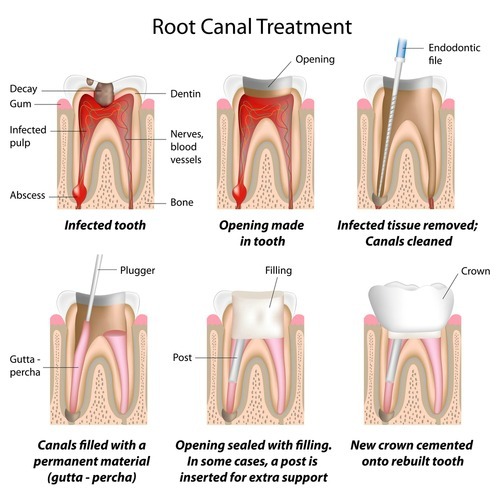 Listed below are some of the available root canal treatment options to consider. Extract tooth and no replacement tooth. Most often, this will result in undesirable shifting and movement of your adjacent and opposing teeth and negatively impact your bite. 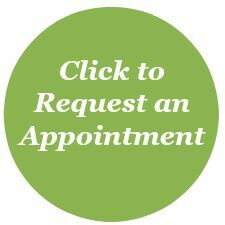 Be sure to ask any questions regarding your treatment options or about dental insurance benefits coverage before making your final decision. The root canal procedure may require one or two dental appointment visits. The appointment time length varies according to the location of the tooth. Far back molars have multiple roots and require a longer appointment time than a single rooted front tooth. Contrary to the media perception and jokes about having a root canal, root canal treatment can be comfortably performed using local anesthesia. Nitrous oxide (laughing gas) is available. Read our complete list of other available patient amenities. There are four main steps to perform a root canal once the tooth and surrounding tissues feel completely numb. The dentist will make a small hole (opening) in your tooth in order to access the dental pulp and nerve chamber. Afterwards, the dentist will use a series of endondontic files to remove the dental pulp and to clean each nerve chamber. Once each root canal is clean, the dentist will fill and seal each root canal with an inert material called gutta percha. A tooth that has had root canal therapy no longer has live blood supply; therefore, becomes very brittle and prone to fracture. A post and/or crown buildup is necessary in order to support the permanent placement of a dental crown or dental bridge to preserve and retain your tooth, often for a lifetime. It is not uncommon for the first few days following root canal therapy for your tooth and surrounding tissues to feel tender and/or sensitive. Over the counter medication like Advil or Tylenol can help reduce discomfort. If you have unresolved pain that lasts more than a few days or if your symptoms increase, please call us at (763) 586-9988. Your dentist will want to discuss your symptoms and reevaluate your tooth. Be careful not to bite or chew with the tooth that just had root canal therapy until the tooth symptoms subside and the tooth is restored with a permanent dental crown or dental bridge. 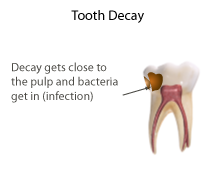 If a primary tooth has been diagnosed with extensive dental caries (cavity) that extend into the nerve of the tooth or if a primary tooth becomes infected or injured, your dentist will likely recommend that your child’s tooth have a pulpotomy or a pulpectomy if the tooth will not naturally exfoliate soon. Traditional root canal therapy on adult teeth serves to restore the tooth for a lifetime, this is not necessary for primary teeth that will eventually be shed. A pulpotomy is the removal of dental caries and the dental pulp, not the nerve itself. In lieu of a filling, the dentist will place a medicated dressing and filling material that promotes the nerve to heal. Oftentimes, this filling material is covered with a stainless steel dental crown. This crown will stay in place until the tooth naturally exfoliates. 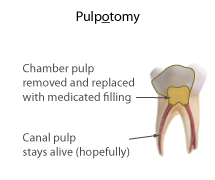 A pulpetomy is similar to root canal therapy performed on an adult tooth. The dental pulp and nerve are both removed during a pulpectomy. The root canals are cleaned, filled, sealed, and a stainless steel crown is fitted and cemented over the tooth till the tooth naturally exfoliates. Q. Does getting a root canal hurt? A. The symptoms preceding having root canal therapy can definitely be painful, but the actual root canal therapy procedure is not. Your tooth and surrounding gum tissue will be anesthetized before starting root canal treatment. Nitrous oxide (relaxing gas) is also available. Q. How many dental appointments are required to complete a root canal? A. Most root canals can be completed in a single appointment. Q. How much does a root canal cost? A. The price of a root canal is dependent upon the number of canals a tooth has. Q. Does dental insurance cover the cost of root canal treatment? A. root canal therapy is a covered dental benefit under many dental insurance plans. The amount of coverage varies. One of our patient care coordinators will happily assist you to determine you potential out of pocket costs.